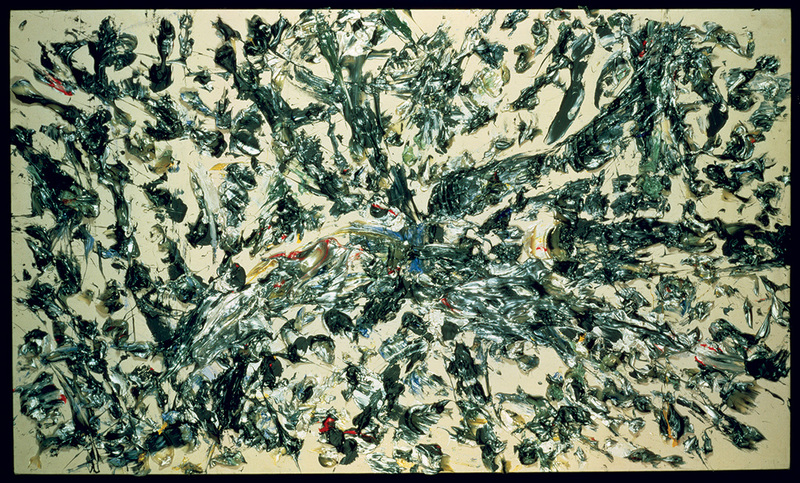 Both lyrical and commanding, Roy Lerner’s paintings prove that the tradition established by Jackson Pollock and the New York School is alive and well and continues to inspire major figures. Lerner’s work has been first rate and consistently surprising since the late 1970’s. And he can express himself beautifully in other materials and styles as he showed in his aluminum mesh pictures of ’93-‛94, his purely poured pictures, or his recent, stunning, color field, stain paintings. Together with his well known stutter stroke pictures, this makes four distinct styles. And there are in-between pictures too. Lately he has taken to sculpture, drawing in steel. Lerner studied art at Franconia College in New Hampshire between 1974 to 1977. He was mentored there by a very gifted artist, Peter Bradley. Bradley gave Lerner direction and introduced him to the painter, Kenneth Noland, and Anthony Caro, the English sculptor. Lerner served as Caro’s assistant in London for three months in 1976 and, thereafter, took Caro’s advice and traveled to see the great art of Europe. He has always said that he was most taken with Gericault’s “Raft of the Medusa”, Michelangelo’s Sistine frescoes, and Monet’s ‘Waterlillies,” in other words, the heroic and the painterly. When I first met Roy in the late 70’s, he was painting with a spray gun and influenced by Jules Olitski, like so many painters in those years. He somehow struck me right away as potentially a major figure, and I put his work into a group show I organized in 1983 for the Danforth Museum in Danforth, Massachusetts: “Abstract Art in New England”. Another young painter, Jill Nathanson, stole the show with her fresh, outrageous pictures. They had a stained ground on top of which she applied heavy gel in a free form, rhythmical way. The pictures retained the tonal, all-over, close value qualities of Olitski but felt fresh and new. This had to do with an aggressive use of acrylic gel which, at that stage, was cloudy and yellowish. It tended to put people off. Some called it “yucky”. 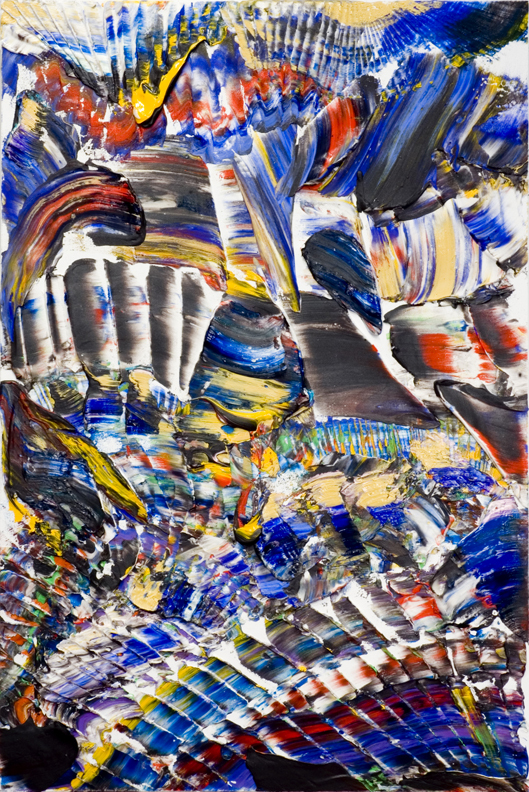 Like some younger painters of the time who were reacting against Olitski’s spectacular refinement, Nathanson’s pictures made “yucky” a new positive. Here was a way beyond Olitski. Modernism was about to assimilate Postmodernism. 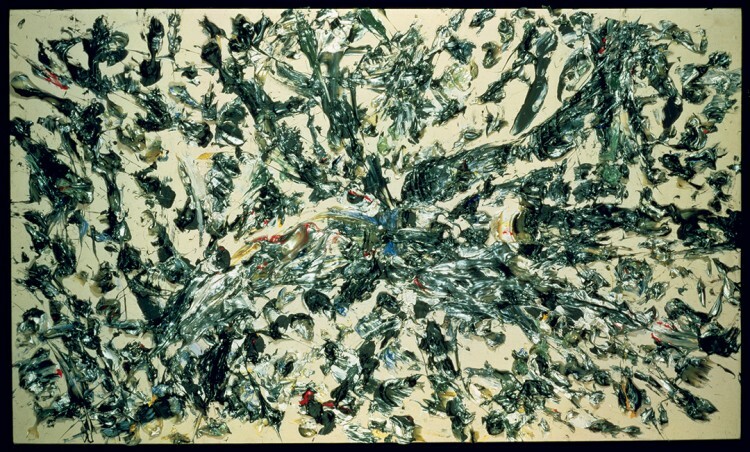 Like Roy, Nathanson was a child of the psychedelic 1960’s, and thus knew how to use “bad taste” as an edge, as the way to a more aggressively expressionistic form of address distinct from the high impassiveness of Olitski. Roy loved these pictures of Nathanson, and, as it turned out, understood their implications better than Nathanson herself. 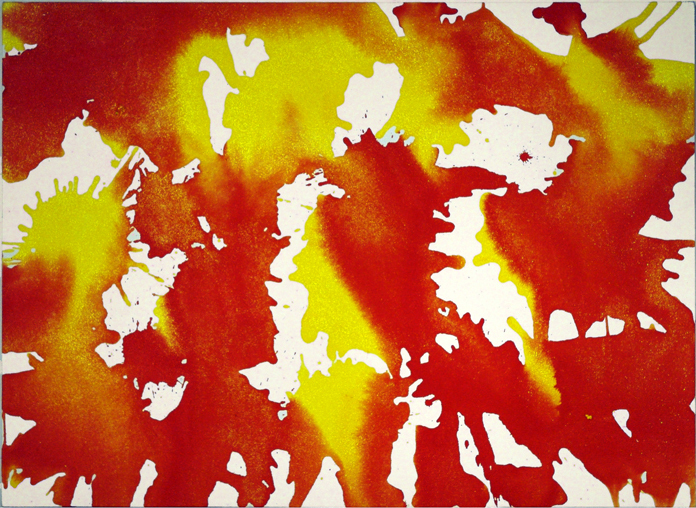 Attending the Triangle Lake Workshop in Pine Plains, New York, in 1984, Lerner produced a series of yellow pictures with thick gel, which were very free form and done on bare canvas. The “yucky” gel was both naked and fully modulated into color. Utterly authentic and unfamiliar, they were declared the best paintings at the camp by Clement Greenberg, who was a guest critic that year. Roy is one of the charter members of the New New Painters, a group which emerged in the early eighties following on the Color Field generation of the sixties. They turned back to Abstract Expressionism but now seen through the eyes of the Color Field generation and reimagined by means of the huge advance in development the acrylic medium. They explore the look and feel of the new acrylics, especially the gels which, among many other virtues, make a far bigger range of thickness than oils ever had. In fact, along with other colleagues, Roy has played a role in the development of the acrylic medium. 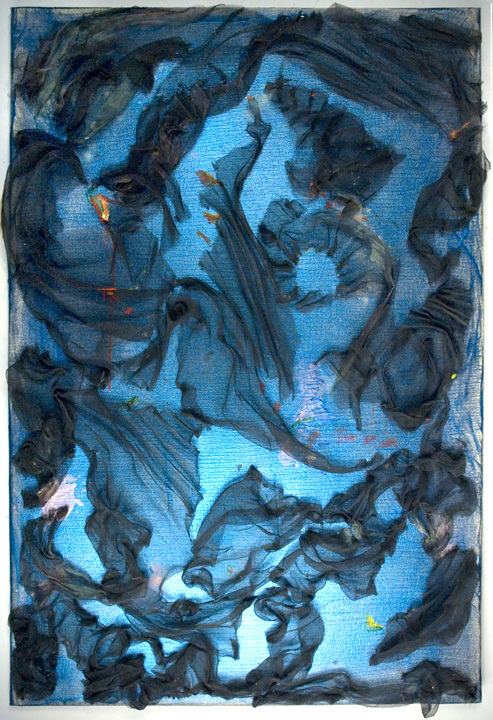 From the first, he has shown a unique gift for tonality – an especially rich, middle value range – which is the mark of the pure painter and is what first drew him to Olitski. This meant that he was uniquely capable of exploiting gel’s “yucky”, yellowish character by playing it off against true yellow. These were his breakthrough, Triangle picture. Here he also used pearlessence, a lustrous, silvery opalescent paint which evokes a fugitive purple in the bare canvas areas. Here was the New New look. But despite the brilliance of these pictures, Roy was still dissatisfied with the yellowish gel, since, ultimately, it was too specific a color and therefore limiting. For this reason, Lerner prompted the chemist, Mark Golden of Golden Artist Colors, to develop a perfectly clear, non-yellowish gel. Golden was successful in 1986. Acrylics thereby became full-bodied medium, clearer and brighter than oils and with many new possibilities. His creative use of new materials is what makes this painting seem so fresh and up to date. “painting is about making your individual mark. I stroke the canvas with a palette knife depositing repeating lines of thick wet gel whose every facet catches the light. This is the cornerstone of my painting structure… Each stroke contains evidence of touch and tell tale signs of emotion. After the first stroke, each subsequent stroke suggests the next and focuses more clearly the possibilities”. Roy’s signature became a choppy, stutter stroke which created rhythmic marks varying over a chromatic or bare canvas ground without ever repeating. This lyrical improvisation on a stated theme evokes the music of jazz greats like Miles Davis, Charlie Parker and John Coltrane, whose music Roy loves. Gradually he has come to rely less on this distinctive mark, becoming more and more free form. The more control Lerner surrenders, the more he relies on his in-the-moment inspiration, the freer and stronger his painting becomes. Also, the freer he becomes, the more his pictures evoke images of landscape, cities, figures of all sorts, as well as phantasmagoric events. These come and go and are never so insistent as to interrupt the flow. They resonate our experience and give character and intimacy to the picture. We delight in their miraculous appearance within Roy’s utterly free form, abstract paintings. Roy is represented by galleries in New York, San Francisco, Toronto, and Montreal. He has also shown in France, Germany and even Korea. He’s been especially successful in Italy. Still, he hasn’t had anything like the success his works warrant. Here’s a case in point. Roy’s work has sometimes been compared to that of the German painter, Gerhard Richter, who is surely the most celebrated abstract painter working today. This October, one of Richter’s canvases sold for $34.2 million at Sotheby’s in London, which was the highest price ever paid at auction for a work by a living artist. Roy’s work, on the other hand, has never even appeared at either of the big auction houses, Sotheby’s and Christie’s, which, in effect, create the high end secondary market and artworld renown. Yet Roy is a far more focused and consistent painter than Richter. Roy is also a lot more original, varied and free. 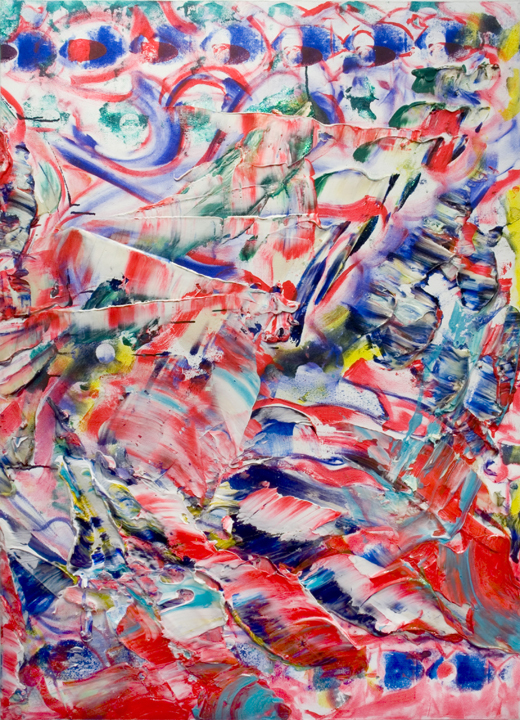 And while Richter seems to imitate acrylics with oils, Roy revels in the new acrylic medium and all of the unique effects that it makes possible. Richter’s best pictures, which, it must be said, are very far and few between, do have an expansive feeling, thanks to his use of a huge plastic trowel. Roy’s typical pictures, those with his stutter stroke, made with a plastering knife, are, in comparison, more intimate and personal. 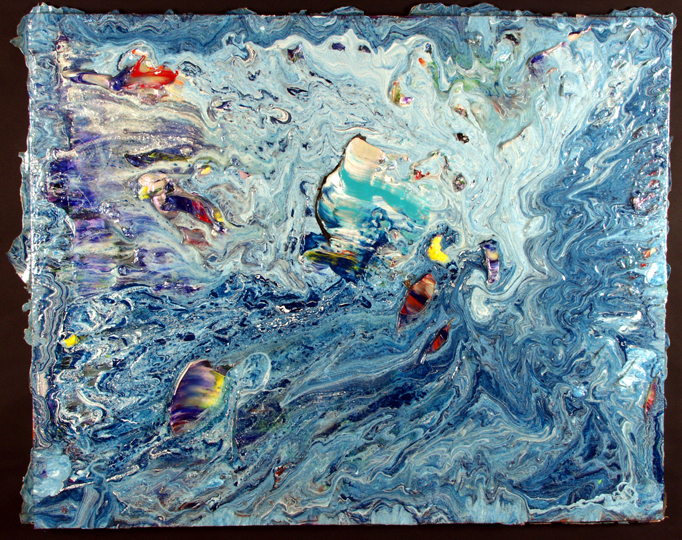 (Roy sometimes gets a large feeling into his stutter stroke pictures and into some of his stained and poured works too.) Richter has often embraced postmodernist, conceptual art “strategies” which doubtless account for his popular success. But this has also meant that there have been long periods (and many entire exhibitions) in which his pictures are vacuous and visually inert. (So, for example, his monochromes or his most recent show of the “strip” pictures, at the Marian Goodman Gallery in New York.) Roy has never lost concentration like this and, consequently, has done more great pictures at 58 than Richter has done at 80. Roy is the true master here even though he works outside the limelight. He has been a major figure for the last 30+ years and still has lots of time to further develop and expand his art. As I noted above, in addition to his stutter stroke pictures, Roy has created three other distinct styles or idioms which do not depend on his personal mark: the aluminum mesh pictures, the poured pictures, and the stained, color field pictures. Like the stutter stroke paintings, these too are full scale statements. Roy has done many more of the stutter stroke type than of the others, but I’d expect he will turn more to these styles in the future. “Energy is eternal delight” wrote Blake. This is what Roy’s paintings are all about. Yes they have very contemporary look and feel. Yes they are brilliant conceptions and have strong, often daring, color. Yes they have virtuoso, improvisational drawing and miraculous emergent imagery. Above all though, each of his pictures offer a vital presence, a focused energy. If you give to them your serious, wholehearted attention, they’ll give back to you forever, their freshness never fades.